This name uses Spanish naming customs: the first or paternal family name is Arroyo and the second or maternal family name is González. Álvaro José Arroyo González (also known as Joe Arroyo or El Joe; 1 November 1955 – 26 July 2011) was a Colombian salsa and tropical music singer, composer and songwriter. He was considered one of the greatest performers of Caribbean music in his country. Joe Arroyo was born and raised in the neighborhood Nariño in Cartagena. Arroyo's singing career began very early, when at the age of eight he sang in brothels in Tesco, a red-light zone in his hometown. In the beginning he sang with groups like "Los Caporales del Magdalena", "Manuel Villanueva y su Orquesta", "La Protesta" and "Super Combo Los Diamantes", in 1971 he recorded with "La Promiscua". As is mentioned, pronounced, remarked, and showed by him in some of his songs "...En la Plaza de Majagual, Sincelejo..." Joe, did it concerts as young singer in this city, place, downtown. In 1971 Arroyo had his biggest opportunity of becoming a nationally known artist. He was discovered by Julio Ernesto Estrada, the bass player and director of the band Fruko y sus Tesos and signed up with Colombian record label Discos Fuentes. 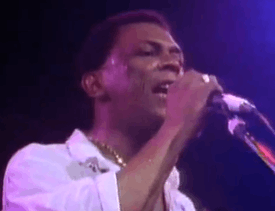 He performed with the band for ten years until 1981 when he began his solo career leading his band, named "La Verdad" (The truth). Joe Arroyo became very successful by mixing salsa, cumbia, porro, soca, compas (or konpa), zouk and other music from the African Diaspora in a unique style. Some of his most famous songs are "Rebelión","La noche" "Tania", "El ausente" and "En Barranquilla me quedo". Arroyo was forced to cancel several performances due to his health problems. On more than one occasion, he was thought to be dead because of his abrupt absences from media attention. Joe Arroyo had to go through surgery because of problems with his eyes. He was once seriously ill for about 3 months due to a problem with his thyroid even though many had attributed it to drug abuse, which the singer denied in Rolling Stone magazine, Argentina in January 2004. Arroyo died in Barranquilla on 26 July 2011, after spending nearly a month in hospital due to multiorgan failure. During his stay in the hospital his health deteriorated. The day before his death, doctors announced the singer was suffering from several organ failures including renal and heart failure and he was given his final sacrament by the local bishop. The singer died at 7:45 local time. Between June and December 2011 the RCN channel broadcast a soap opera based on the singer's life called The Joe "The Legend". On 9 November 2011, Shakira was honored as Latin Recording Academy Person of the Year and performed a cover of Arroyo's song "En Barranquilla Me Quedo" at the Mandalay Bay Events Center as a tribute to the singer. A three meter tall bronze and copper statue of Arroyo was unveiled in Cartagena, Colombia in 2013. A Latin Grammy Award is an accolade by the Latin Academy of Recording Arts & Sciences to recognize outstanding achievement in the music industry. Joe Arroyo received two nominations, and in 2011 he was presented with a posthumous career award. ↑ "La plaza de Majagual, famosa por el Joe Arroyo" (in Spanish). Open google search for Joe Arroyo Plaza de Majagual .org web pages. 24 April 2013. Retrieved 20 November 2015. ↑ Harris, Craig. "Biography: Joe Arroyo". AMG. Retrieved 18 May 2010. ↑ "Colombian music legend Joe Arroyo dies at 55". Retrieved 26 July 2011. ↑ "Shakira Honored as Latin Grammy Person of the Year". Billboard. 10 November 2011. Retrieved 16 November 2011. ↑ "Emotivo tributo a Shakira como Persona del Año" (in Spanish). El Heraldo. 10 November 2011. Retrieved 17 October 2013. ↑ "Statue of Colombia salsa legend Joe Arroyo inaugurated in Cartagena". 1 October 2013. Retrieved 16 May 2015. ↑ "Cartagena inauguró estatua del 'Joe' Arroyo" (in Spanish). 31 October 2013. Retrieved 15 May 2015.